The Project 1855 Priz Deep-Diving Rescue Vehicle was designed by the Lazurit Central Design Bureau Open Joint Stock Co. Lazurit was established in 1953 to design and construct combat and special-purpose submarines, as well as underwater constructions and vehicles. Some accounts suggest that the Project 1855 submarine is the Mir-class, but these accounts are evidently in error. There is very little known about Russia deep rescue systems. 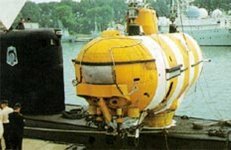 The Krasnoye Sormovo plant built four [some reports claim five] titanium-alloy Priz rescue submersibles able to accommodate 20 men and dive as deep as 1,000 meters. Krasnoye Sormovo also made one air-transportable Bester submersible which had an 18-man capacity and a diving operational depth of 720 meters (the second Bester vehicle had not been completed as of 2002). Disputing these Russian accounts, one western source claims that Other sources claim the Priz, operated as an unmanned capsule, can carry nine evacuees at a time, while the Bester can carry up to 20. The Priz, about 44 feet long and 19 feet high, is believed to be operable in either manned or unmanned mode. Some sources suggest it has a battery endurance of only three hours. The situation of the enterprises forming the core of regional military-industrial complex in Nizhny Novgorod oblast include Lazurit and Krasnoe Sormovo. They produced diverse defense equipment, including rescue submarines "Bester" and "Priz". Due to lack of proper funds, this equipment was not upgraded since mid-1980s and nowadays is not used properly. Upgrades were proposed that would allow the sub to dock with damaged submarines, along with improvements to their navigation equipment. A Project 1855 Priz Deep-Diving Rescue Vehicle was involved in the Kursk accident. It was much-needed in the aftermath of the accident with Kursk submarine. On the morning of 13 August 2000 the submarine of the Main Intelligence Department investigated the KURSK bow. At 18:00 and 18:30 were carried out the first two descents of a diving bell from ALTAY rescue ship. At 19:30 Project 1855 DSRV from MIKHAIL RUDNITSKIY discovered by sight the submarine laid on seabed. 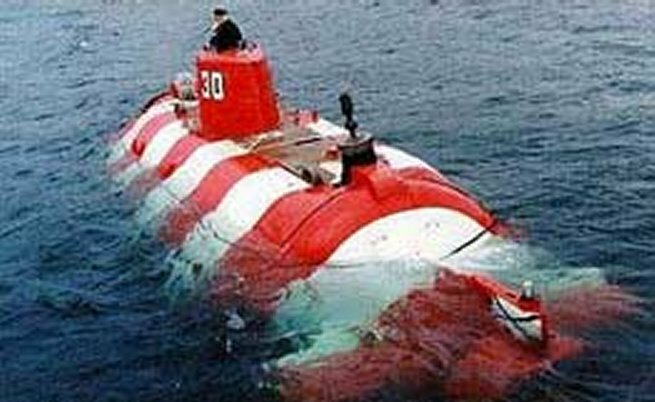 At night on 15 August 2000 the Kursk submarine's bow was inspected for the first time by a deep submergence vehicle, which obtained data about the damage to the bow. It was determined that two fore compartments had been flooded. The next morning the rescue operation was temporary halted the storm that had begun that night. 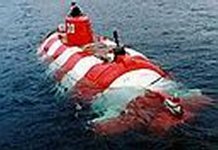 Only when the weather had improved did the attempts of diving and docking of DSRV were started by two PRIZ-type vehicles. The first diving lasted from 20:00 till 5:30 (four unsuccessful docking attempts). That day the surviveing crew members of the Kursk stopped the sending distress signals. On 04 August 2005 the AS-28, a Priz-class submarine, was trapped on the Pacific Ocean floor off the Kamchatka Peninsula. 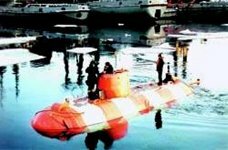 The accident occurred after the mini-submarine was launched from a rescue ship during a combat training exercise. Initial reports said that the Russian mini-sub sank after it become entangled in a fishing net at a depth of 190 meters. It subsequently emerged that the AS-28's propeller had become entangled in metal cables from the antenna of an electronic underwater monitoring network -- part of Russia's coastal defenses -- during military exercises. The accident occurred in Beryozovaya Bay, about 50 miles south of Kamchatka's capital, Petropavlovsk-Kamchatsky. A rescue vessel attempted to tow the disabled submarine to shallower waters. The United States and Britain helped in efforts to rescue the crew. 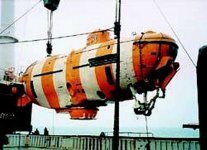 On 07 August 2005 the seven Russian sailors trapped aboard a Russian mini-submarine for almost three days are back on the surface after a British undersea rescue vehicle severed the cables that had trapped the mini-sub. After climbing out of the Russian AS-28 submarine, the seven members of the crew were examined in the clinic on a naval ship. All of them are reported to be in satisfactory condition. The vessel rose to the surface at 7:15 in the morning Moscow time. He said the crew opened the hatch themselves, exited the vessel and climbed aboard a speed boat. The crewmen were forced to wait for nearly three days while rescuers raced to free them. As air supplies were running out the crew put on thermal suits to help them stand the frigid temperature on the ocean floor. They were told to lie flat and breathe as lightly as possible to conserve oxygen.